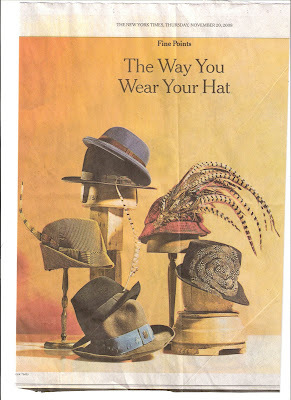 Knowing how much her daughter loves hats, mom brought over this clipping from the NY times yesterday. The picture doesn't do them justice, so zoom in to see the detail. The plaid hat with the luscious cascade of feathers is Ralph Lauren for a mere $950 (without the feathers a real bargain at $525), but the one I particularly like is the Albertus Swanepoel black fedora with spiral guinea fowl feathers. Only $425 at Barneys.